One of the creepiest gaming experiences of my childhood was called Asylum, a downright crazy text adventure with graphics scaring the hell out of me back then. As I never actually managed to complete the game it has kind of stuck with me over the years and hung over my head like an unfinished memory. To finally come to terms with it, I've decided to blog through the adventure games developed and published by Med Systems Software of which Asylum (confusingly aka Asylum II) is the last. 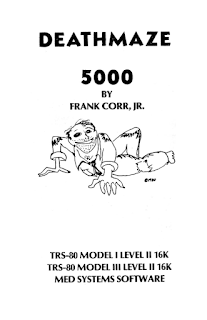 The rather unknown company was founded around the beginning of the 1980s and first released a series of simple maze adventure games called Rat's Revenge, Deathmaze 5000 and Labyrinth for the TRS-80. They cannot be found anywhere on MobyGames and the early history of Med Systems is generally in the dark but sometimes retro gaming calls for a little bit of digital archaeology, right? The TRS-80 was a budget computer released by Tandy Radio Shack in 1977, along with the Apple II and the Commodore PET 2001 – the three of them are often referred to as the “first trinity” of homecomputers. Ironically dubbed the “Trash-80”, its place in gaming history was secured by a certain Scott Adams who managed to port his version of the original “Advent(ure)”, named Adventureland, to this very simple micro machine. 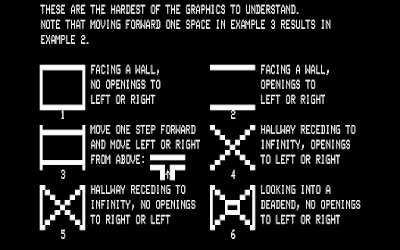 Med Systems was yet another prolific developer of text adventures for the TRS-80, focussing on simplistic graphics with a 3D effect established by its particular perspective. Their early games look like a more technical, not so much hand-drawn variety of Roberta Williams's Mystery House and I'd like to see some release dates to know who actually came first and whether we'll have to rewrite history on this one. However, I'm not entirely sure that the first three games can be regarded true adventures just yet but time will tell if they are indeed “missed classics” or curiosities best forgotten. The Institute, written by Adventuresoft alumnus Jyym Pearson and released in 1981, and Asylum II, written by William F. Denman jr., I remember to be (somewhat) quality stuff, though, so a historical write-up may well be in order. Rat's Revenge, the first of the games, has left the fewest traces online. While its follow-ups appear to be remembered fondly (although they are scaringly labeled as practically unsolvable), I cannot turn up anything else about this apart from it having been written by Frank Corr jr. The game itself can be found on “Magic Chris's Asylum page”, a labor of love dedicated to the Med Systems games complete with a preset TRS-80 emulator and all necessary disk images. While Rat's Revenge may not actually be an adventure game in the truest meaning of the word, it's an interesting starting point for two reasons: As “digital antiquarian” Jimmy Maher has pointed out, genre of maze games is one of the predecessors of proper interactive fiction, notably Hunt the Wumpus (1972) which works very similar to Rat's Revenge, only without graphics. Additionally, Med Systems Software is credited as one of the earliest companies to release commercial games implementing proper 3D graphics which ties in nicely with mainstream gaming history as 1980 was also the year that Atari's Battlezone hit the arcades, wowing everybody with 3D vector graphics, and one of the last games released by Med Systems for the ZX Spectrum – before they were bought out and subsequently closed down by Screenplay – was Phantom Slayer, one of the most notable predecessors of the first person shooter genre. 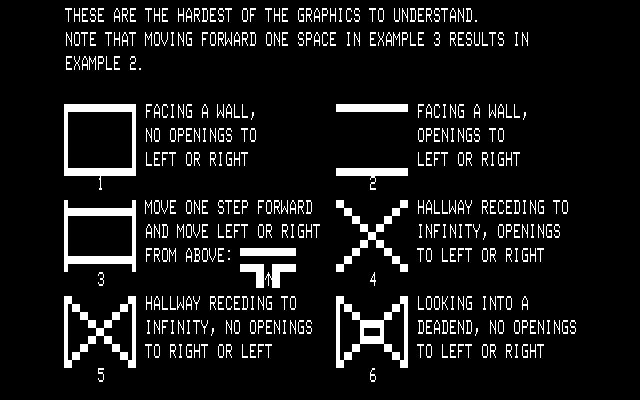 It's very interesting that the in-game manual of Rat's Revenge explains the possible depictions of the rooms, not trusting the player to decipher the unusual perspective correctly but making sure that s/he gets what it ought to represent. A 3D graphics tutorial! DOOM this is not. Rat's Revenge is more maze than adventure game but still, like Hunt the Wumpus for the whole genre, a precursor for things to come. The three subsequent games all use the same visual style and require the player to map the 3D mazes to progress in the story. Rat's Revenge, however, has next to no story. You play a rat that has to escape the stereotypical labyrinth and your plot for “revenge” is to find a piece of cheese hidden somewhere in the maze to avert starvation. A dish best served cold, indeed. Although the title most likely hints at a 1965 song by the band The Rats, it doesn't make much sense without this reference. 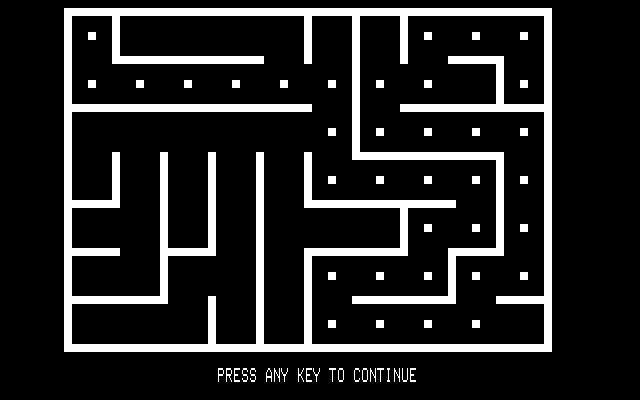 The mazes are generated randomly and the player can decide whether s/he is a novice or not, resulting in different-sized levels. Success is telegraphed by a final graphic showing the piece of cheese along with the words “Delicious.. burp!” Afterwards the player is shown a bird's eye view of the maze and the path s/he took to get through it. The score represents the deviation from the “main trail”, ie. the best possible outcome, thus the lower the score the better the result. It's apparently possible to use a built-in hint system but I didn't need to use it and have no clue as to how it works. The game is much more fun than taking the stairs in any early Sierra game but still very simplistic. 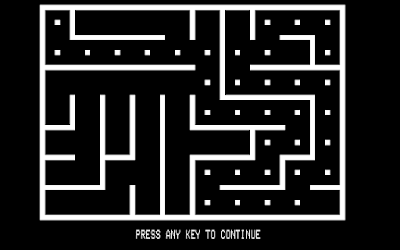 A small maze takes roughly a minute to be set up, a large maze takes considerably longer – three to five minutes according to the game. “You may be sorry”, it warns you if you pick the large maze, and indeed it's much harder not to starve in this one. As a novice, small numbers in the corner of the screen hint at your proximity to the piece of cheese. If you get closer in any mode you are informed that you “smell the cheese”. Mapping is essential in the large mazes as all of the twisty passages really do look alike and it's fairly easy to get lost. It's quite a relief to finally get to the cheese and though the game is a simple maze genre piece it's still fun. To rate it with the PISSED system would be a bit absurd, though, as it's not really an adventure game. It still felt necessary to include it for the sake of completeness, so onwards to Deathmaze 5000 it is! 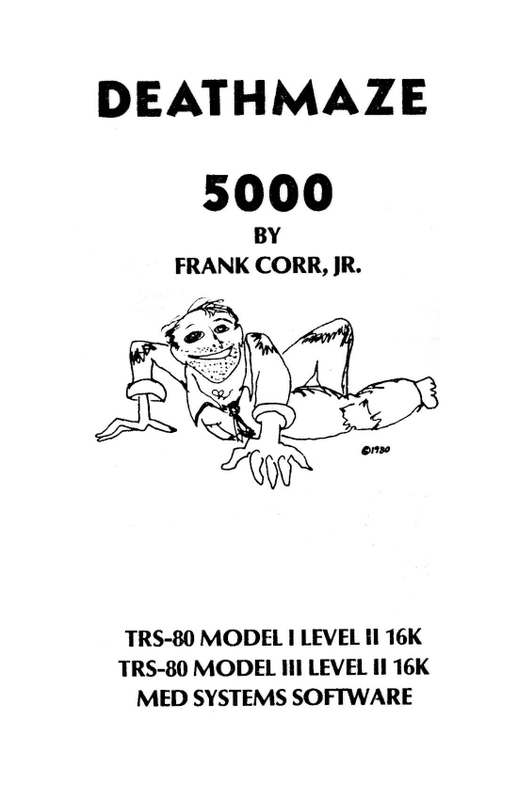 Deathmaze 5000 was presumably the second Med Systems game and apparently co-written by Frank Corr and William Denman. It is the first part of the so-called “Continuum Series”, a succession of 3D adventures with simplistic graphics combining elements of maze games with adventure puzzles, a parser and an inventory. The goal of Deathmaze 5000 is to escape a five story building – you start on the top floor and slowly make your way down, past monsters and traps. Med Systems dubbed it “the most complex adventure ever written” and claimed that only two people had successfully solved it by December 20, 1980 – we may be in for a rocky ride here. The survival aspect is further stressed by the need to find food and torches; once again, there is a built-in hint system and movement is very similar to Rat's Revenge. Let's see next time how far we'll get on our first attempt – the race is on! Note Regarding Spoilers and Companion Assist Points: There’s a set of rules regarding spoilers and companion assist points. Please read it before making any comments that could be considered a spoiler in any way. The short of it is that no points will be given for hints or spoilers given in advance of me requiring one. Please...try not to spoil any part of the game for me...unless I really obviously need the help...or I specifically request assistance. In this instance, I've not made any requests for assistance. Thanks! This is also an Introductory post. Don't forget that you can make a guess at the PISSED rating for bonus CAPs. Okay, so it's more fun than the stairs in a Sierra game, but how does it compare to Rosella's time on the whale's tongue? "Scott Adams who managed to port his version of the original “Advent(ure)”, named Adventureland, to this very simple micro machine." Fair enough, the sentence is not very clear in that it‘s not a port but a different approach to the same kind of game/plot/pattern (thus: his version of). My mistake. So, which came first, Deathmaze or Sierra's Mystery House? I am just wondering whether this game would deserve the epithet of the first graphical adventure game. I'm guessing 29, simply because Mystery House got the same rating. Seems impossible to tell. Mystery House was released on May 5, 1980. Deathmaze 5000 was released sometime in 1980. I may have to join LinkedIn to ask William Denman some questions if he‘s willing to answer them...I couldn‘t find any trace of Frank Corr, though. The who-came-first discussion may become moot depending on what Jason Dyer will find out by playing 1979‘s Journey, apparently one of Roberta‘s inspirations for Mystery House. Having played Journey for a few minutes I take that back: it‘s a text adventure. Btw, Denman‘s final credit in the gaming industry is for the production of the Civilization II Gold Multiplayer Edition. For me as a reformed Civ addict this journey has just become more personal than I‘d anticipated. I'll guess 33, because... well, because!